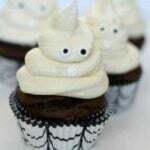 These simple Halloween Ghost Cupcakes are a fun way to decorate cupcakes for Halloween. Whether you make your own cupcakes or use store bought, these cute ghosts are sure to be a hit with both kids and adults. 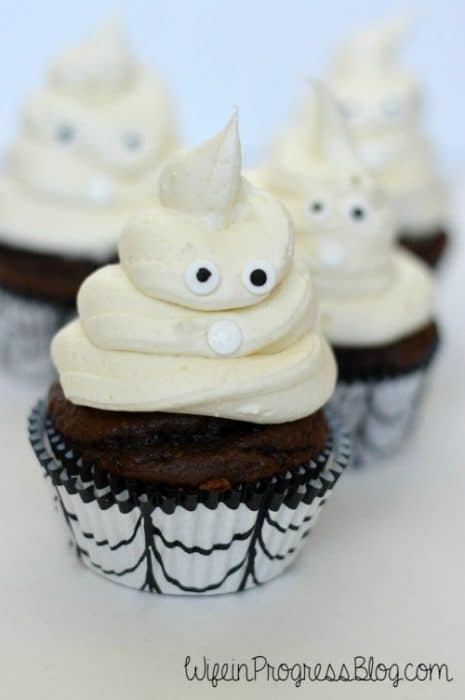 I’m continuing my All Hallows Eve week by sharing these adorable Halloween Ghost Cupcakes with you today. These are quite simple to make and the kids will love the end result. I prefer to use my favorite Chocolate Cupcake recipe with a straight-forward buttercream but you can of course use a box mix if don’t want the hassle of baking from scratch. I picked up the cupcake liners at HomeGoods but I’ve seen really nice ones at the dollar store, too. These Halloween cupcakes are probably cuter than they are scary, but that’s ok! Plus, they couldn’t be easier to make! I bet even your kids (with a little practice) can pipe the ghosts on! Preheat the oven to 350 F/175 C. Line a cupcake tin. Set aside. Melt the butter and chocolate together in a double boiler on the stove. This may be accomplished by putting a heat-proof bowl over a pot of simmering water (don't let the bowl touch the water). Stir until smooth. Set aside to slightly cool. In a medium-sized bowl, mix the cocoa powder, flour, baking soda, baking powder, and salt together until combined. In another bowl, beat the eggs, sugar, brown sugar, and vanilla together until smooth. Add the cooled butter/chocolate mixture and beat until smooth. Add half of the flour mixture, then half of the buttermilk, alternating until everything has been incorporated. Stir until just combined; do not over mix. Divide the batter into the cupcake liners. Bake for 18 minutes, or until a toothpick inserted in the center comes out clean. Allow to cool completely before frosting. Beat together butter and vanilla. Slowly add confectioners sugar until desired thickness and sweetness is achieved. Place in a piping bag or freezer baggy with the edge snipped. Frost cooled cupcakes in a concentric circular motion. Add candy eyes and a mouth. Refridgerate to set.